With less than 48 hours left for onset of Durga puja, artisans are working overtime to give final touches to pandals across the city. SAMBALPUR: With less than 48 hours left for onset of Durga puja, artisans are working overtime to give final touches to pandals across the city. At least 64 pandals are being erected in the city this year. 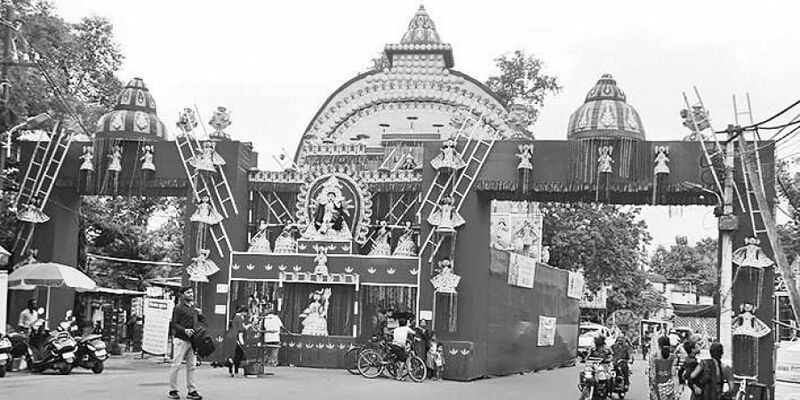 The puja organisers of Budharaja area have roped in artists from Rourkela for their pandal which is being constructed in the shape of a 50 feet wide and 65 feet high Shivalinga. Joint Secretary of Budharaja puja commitee Debraj Oram said the estimated cost of the pandal is `7.5 lakh. Similarly, artists from Jajpur have been engaged in constructing the pandal of Dhanupali puja committee which has carved a niche for itself over the last few years. The committee’s pandal, being constructed at an estimated cost of `8 lakh, will resemble a palace. Dipak Rath, an artisan engaged in constructing Dhanupali pandal, said it is 62 feet high and 50 feet wide. Plastic board, conch shells, glass pieces and bamboo are being used for constructing the pandal, he added. Gobindtola puja committee has engaged decorators from Kolkata to create an attractive temple using materials like palm leaves and bamboo stripes. The estimated cost of the 85 feet wide and 50 feet high pandal is `12.5 lakh. Being the Golden Jubilee year, the organisers are emphasising on lighting with `24 lakh being spent for the purpose. The pandal will have as many as 17 gates. The Disney Castle of world famous Disneyland is being recreated at Daleipada. The pandal is being constructed using clothes, bamboo, wood and colour and will have different games for children. Besides, devotees are looking forward to rituals at Samaleswari temple, Pataneswari temple and Kalibadi in the city.